Back to the Future Part II or Back to the Future II is a video game developed by Mirrorsoft based on the Back to the Future Part II film. It was originally released for home computers in Europe before being ported to the Sega Master System in 1991 by Climax (as Images Ltd). 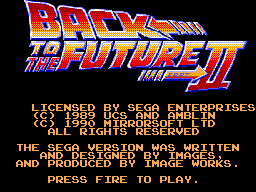 Back to the Future Part II is divided into five levels with four different playstyles - levels 1 and 5 involve Marty McFly attacking bad guys on a hoverboard (in 2015 and 1955, respectively), level 2 is more tactical, involving getting girlfriend Jennifer out of her future home without being seen, level 3 is a traditional side-scrolling beat-'em-up and level 4 is a tile puzzle game. The game has been panned by critics over the years for its unresponsive controls, issues surrounding collision detection and neglect for the original source material. Of particular note is the fact that hoverboards can ride on water in this game, something the film distinctly points out is not meant to be possible. Image Works would later publish a game based on Back to the Future Part III which was met with similar negative reviews. Main article: Back to the Future Part II/Magazine articles.